After 38 years of being headquartered in Wilmore, Kentucky, the Board of Directors of Good News announced that it will be moving its advocacy ministry and publishing endeavor to the Houston area. 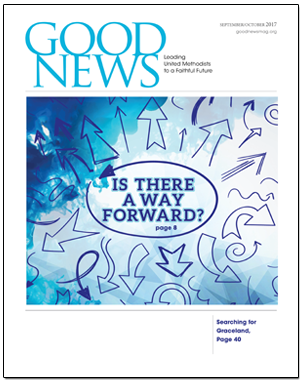 The evangelical renewal ministry within the United Methodist Church has been the publisher of Good News magazine since 1967. “In recent years, Good News has made a leadership transition. Both Rob Renfroe, our President and Publisher, and Norm Phillips, our Chief Operating Officer, reside in the Houston area,” said the Rev. Keith Boyette, chairperson of the Good News Board of Directors. “For Good News to remain an effective force for reform and renewal in the United Methodist Church, we wanted to position our headquarters in close proximity to our senior staff. In addition, the relocation of our headquarters takes advantage of our significant relationship with a number of strong and vibrant evangelical churches, clergy, and lay persons in the Southeast and South Central Jurisdictions. Good News’ long tenure in Wilmore began in 1972 when founding editor Charles Keysor left the pastorate of Grace United Methodist Church in Elgin, Illinois, to join the faculty of Asbury College in order to develop a program of Christian journalism. The move of the ministry to the Houston area—the fourth largest metropolitan area in the United States—was a unanimous decision on the part of the Good News Board of Directors. The administrative office will be relocated in November to Spring, Texas. The editorial office will remain in Wilmore, Kentucky, until next spring. Correspondence and donations will still be received at the Wilmore office until the editorial office is moved. —The Good News editorial team.